Sixty years ago, a slight, neatly dressed black man stood on the corner of Seventh and Patterson Streets in Winston-Salem, North Carolina. He was playing his guitar and singing ragtimey blues. This guitar player was Blind Boy Fuller. He would become one of four great Piedmont bluesmen who were then all making the circuit of the North Carolina tobacco towns like Winston­ Salem, Greensboro, Durham, and Raleigh, during the Depression. The other three–Reverend Gary Davis, Sonny Terry, and Brownie McGee–all had long and successful careers, especially Terry and McGee. Blind Boy Fuller, though, was a blues musician for little more than ten years, but his influence and the memory of him and his music have lasted a long time. His real name was Fulton Allen, and he was born, probably in 1903, in Wadesboro, North Carolina. Not many details of his early life are known. However, by 1927, he was married and living in Winston-Salem. It was about this time that Fuller began to lose his eyesight from disease. Only then did he seriously start to sing and play the guitar because he knew that performing on the street was about all that a poor, blind, black man could do in those days. Usually a street musician could do pretty well around the tobacco factories and warehouses because, even in hard times, people continued to smoke. So there was steady work for the factory hands, and they usually had a few loose coins for street singers. By 1929, Fuller and his wife Cora Mae had moved on to Durham. It was here that he came to the attention of J.B. Long, a furniture dealer who had gotten into producing and promoting recordings by local bluesmen. Long became Fuller’s manager, and by July of 1935, Fuller was on his way to New York to record the first of more than 130 sides for the American Recording Company. On this first trip, Long took along Reverend Gary Davis, because of his outstanding guitar playing, and Bull City Red, whose real name was George Washington and who served as Fuller’s guide on the street, as well as helping out with singing and slamming the washboard . However, most of the sides on the first session were of Fuller alone. Davis and Red appeared on only three or four of the twelve sides recorded. Davis was not to record with Fuller again, but Red stayed with him and was with him on his last session. In fact, the only other guitar player to ever record with Fuller was Floyd Council, a truck driver who worked for J.B. Long. Fuller recorded regularly, about twice a year, until his death. Most of the sessions were at the ARC studios in New York, except for one session each in Memphis, Chicago, and Columbia, South Carolina. In 1937, Long took along a harmonica player to record with Fuller and Bull City Red. Sonny Terry and Fuller had known each other for some time and often played the streets together, but this was the first time they had recorded together. Terry’s whopping harp added a new dimension to Fuller’s music. Fuller, Terry, and Red turned out to be a winning combination. Long kept the team together for most of the rest of Fuller’s sessions, including several sides of gospel numbers on which they are called Brother George and His Sanctified Singers. Bull City Red did the lead singing as “Brother George”. 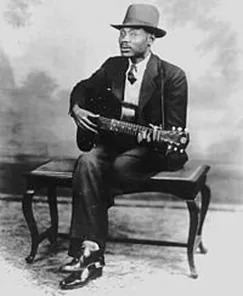 Blind Boy Fuller’s playing style was assimilated from a wide variety of other musicians, but he was most influenced by Reverend Gary Davis. Davis’ powerful bass line and fast fingerpicking runs can be heard in Fuller’s playing. His instrument was a big National brand steel bodied guitar that had a loud, clear tone that was a perfect accompaniment to Fuller’s assured and articulate voice. Fuller, in collaboration with J. B. Long, wrote many songs. Some, like, Step It Up and Go and Red River Blues are country blues classics. The extent of this collaboration has never been explained satisfactorily. Although Long’s name appears on many of the records as composer, there is some question as to whether he was actually the composer or merely copied the words for Fuller. In June of 1940, Blind Boy Fuller made his last recording, Night Rambling Woman. It was obvious to those who were with Fuller in Chicago for this last session that he was seriously ill. Within a month after he returned home to Durham, he was in the hospital suffering from diseased kidneys. He died on February 13, 1941. A few months before Fuller died, Bull City Red met up with Brownie McGee and brought him around to meet Fuller and Sonny Terry. Sonny and Brownie hit it off right away. Brownie admired Fuller’s music, but Fuller, realizing that Brownie was a good singer and guitar player, sensed that they might become rivals and kept his distance. Shortly after he died, Brownie used Fuller’s own guitar and recorded a tribute -The Death of Blind Boy Fuller. Yes, you know it’s hard to tell which place he was loved the best.